A firewood moisture meter is perhaps the most important stove tool for helping you to ensure that you get the most out of your stove. 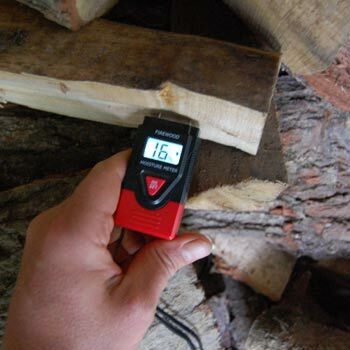 Your firewood moisture meter can help you make sure that you are getting well seasoned wood. Please don't get me wrong - there are many firewood suppliers out there who know their business and when they say that their firewood is well seasoned then it is. You may well find that these firewood suppliers are booked solid so try to get your orders in with them over the summer. Your firewood moisture meter will help to confirm that their wood is indeed well seasoned and let you gauge exactly how well seasoned it is. Conversely there are also firewood suppliers out there who supply firewood, claiming it is seasoned, when in fact it far from it. The first you will know of it may well be when you notice that your woodburning stove isn't giving out any heat and that the window is getting tarred up. It doesn't just stop there burning unseasoned wood will tar up your chimney (increasing the risk of chimney fire) as well as reducing the life of your woodburning stove and chimney. 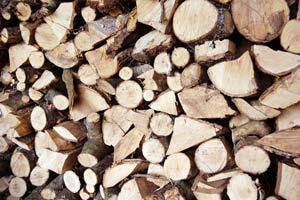 Burning unseasoned wood is inefficient and results in high levels of particulates, which is bad for health. In terms of how much heat you get out of your wood stove the moisture content of your firewood is probably the single most important thing to consider, which is why a firewood moisture checker is so important. 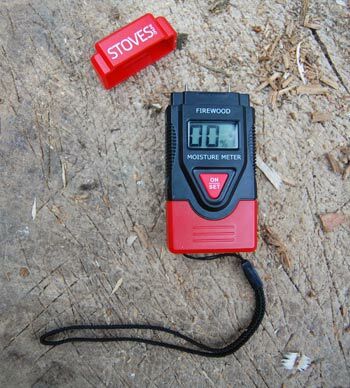 This is the new version 2.0 Stovesonline firewood moisture meter. We have listened to the feedback which you gave us and our moisture meter now has auto power off which means that your 4x LR44 batteries will last much longer. The moisture meter itself is a little smaller which lets it easily sit in the pocket which is how a lot of your (me included) tend to carry the meter around. And lastly the firewood moisture meter has a backlit display; just press the on button and the display will backlight to let you read the display in a dark wood shed. There is a picture of the backlit display down near the bottom of this page if you would like to see it in action. Firstly it makes sense to check with the supplier what type of firewood you are getting, it may be well seasoned, or the supplier may give you an assessment of the dryness of the wood anywhere from freshly processed to partially dry. Next time you get a firewood delivery take out your firewood moisture meter and, before your supplier unloads, grab a couple of logs, split them in half with your axe or hatchet and take a couple of moisture readings. If the firewood is well seasoned then it should have a moisture content of 20% or lower, a few logs at around 25% isn't too bad as long as most of the load is under that. If the firewood is a lot wetter than this then it is not actually seasoned firewood; it's a load of chopped logs that will one day be seasoned firewood when you have dried (seasoned) them. If after having used your firewood moisture meter the wood turns out to be wet, and the supplier is claiming that it it well seasoned, you should either pay less for the wood and store it up until it is dry, or send it back. In a forgiving mood, I might say that some firewood suppliers are not aware of the issues, or do not know how to properly season wood for woodburning stoves. Having recently moved back down to Devon I had to get a couple of loads of firewood in to tide us over the first winter (2009/2010 will be no problem). One of the first loads of firewood for my woodburning stove was at around 40% moisture when I checked with my firewood moisture meter. When I pointed this out they said that some of the load was freshly felled ash which was "OK to burn straight away" (this is a fallacy: ash does have a low moisture content, but all the ash trees I've ever felled have been minimum 35% moisture, even in the dead of winter - i.e. they still need seasoning). The other firewood logs in the load had come from trees which were 'seasoned' because the trunks had been lying in their yard for a couple of years (they had only just processed the logs that day). No wonder the firewood was wet: it hadn't had a chance to dry. It was only because I had my firewood moisture meter that I knew exactly how wet the firewood logs were, although of course there were the tell-tale signs: no cracks in the end grain and a 'wet' smell. You can also use the firewood moisture meter to see how well your firewood is seasoning, which stacking techniques work best, etc. When you are processing and seasoning a lot of firewood it really makes sense to do it in the most effective way possible. I had a small, single log thick, stack of firewood on a south facing section of wall and was astonished to see the moisture drop from around 55% when I first felled, cut, and chopped the logs, to around 17% - all in around 4 months! The firewood I have in a larger stack in a barn is still at 25%, but should be down to under 20% for when I'll need it for my woodburning stove. I also season firewood in woodne stillages which are stackable and using this method bring wood like sycamore and ash down to around 16% or less moisture over the summer. display. Very handy in your dark woodshed. Our Stovesonline firewood moisture meter sits snugly in the hand and has a nice clear display and comes complete with batteries (isn't it annoying when people are too stingy to supply a battery?). 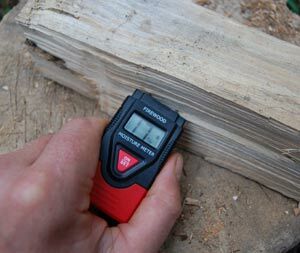 To take an accurate moisture reading you need to measure the moisture on the inside of your piece of firewood: the firewood will be drier on the outside where the wind and sun has got to it. So split a piece of firewood down the middle, push the two pins on the end of the moisture meter into one of the freshly split faces of the wood (not the end grain and not the outside faces of the wood) ideally near where the middle of the piece was before you split it, and press the On button. The moisture reading will appear on the screen as a percentage. I have tested the stovesonline moisture meter against many other types of moisture meter on the market, including some really posh expensive ones designed for joiners/woodworkers, and it compares very well, giving very similar moisture readings.